Even if you’re not designing an Android phone, the Google machine will help differentiate your next SFF hardware design. Listen up. From boards and boxes to power and processors, I've got my newly polished crystal ball at the ready. Although it started as a hobby of founder Lee Crane, VersaLogic’s most remarkable feature is something that ought not to be: old-fashioned customer service. 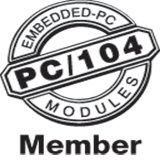 With the approval of OpenSystems Publishing’s Editorial Board, I’m revealing key facts, some suppositions, and a few recommendations for my magazine’s namesake: the beloved PC/104 Consortium. Working together, vendors, customers, and ecosystem partners can get this train moving back on the right track. Since PC/104’s ruggedness is finding homes in more defense applications, let me share some observations on packaging Small Form Factor (SFF) boards. I hate seeing good technology tossed out, so four years ago I purchased a used IBM 233 MHz Pentium 2 MMX PC for use as a home music server. Unused for a while, I recently decided to boot it to see if it even worked anymore. Armed with the hottest desktop processors and interconnects, it’s time for x86-based PC/104 and other small form factors to take an open arms approach to FPGAs. The system and application possibilities would quickly go from trailing- to leading-edge. EPIC Express paves "bridge to the future"